On 22 July 2014 I received from Marcus Campbell in France this charming and funny 1916 poem dedicated to “Sister!”. See below for Marcus’ explanation of how he came by it. Who saw that I was washed and fed? Sister! Whose smile would always hope impart? Sister! Whose whispers sweet had come to stay? Sister! Then wiped the nose without a frown? Sister! Who tender watch would always keep? Sister! Who poked me when I snored aloud? Sister! And thrusts her lantern in my nose? Sister! Then says, “Your bed we want Today”? Sister! “You’re not the only pebble on the beach”? Sister! And motor home.” Lord, let us pray? Sister! The boys were nice, yes, every one”? Sister! How could I? Why, you’re stoney broke!”? Sister! I think that all those who enjoyed reading “A Nurse at The Front” will appreciate this affectionate, teasing and grateful poem, (attached below) which was copied from The Egyptian Mail (2nd March 1916) entitled, “Sister”. I have no idea whether it is already well-known, or not. But it is clearly the sort of response that Edith Appleton must have inspired many times in her patients. A typical piece of Aussie drollery, I think; but nonetheless clever and fundamentally sincere. The poem was found in the papers of my Great-aunt Grace, nee Guthrie, a New Zealand nursing sister, who saw active service with the Australian Hospital Corps first in Eygpt, then in France. 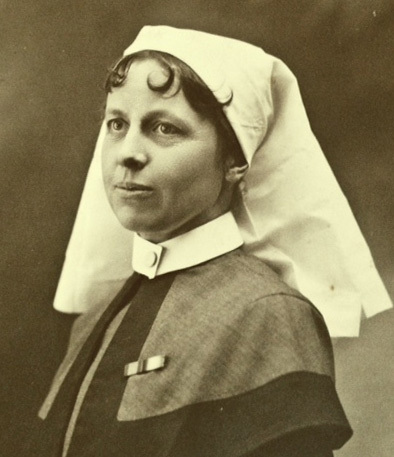 At the outbreak of war, the Australian government offered New Zealand the chance to contribute 13 trained nursing sisters to their hospital ship. Sister Guthrie volunteered and was accepted. She was invalided home from Egypt in March/April 1916 on the immigrant ship SS Demosthenes, and the poem is found in an onboard satirical bulletin (12 typed and carbon-copied pages) called ‘Maritime News’. Perhaps the editor (and typist?) of the bulletin also wrote this poem? Sister Guthrie returned to Egypt when fit, and was later transferred to France, where she was based at Hazebrouck. I vaguely recall something about a transfer to a NZ base hospital at one point, so perhaps her path at some time crossed that of Edith’s brother, Taff? 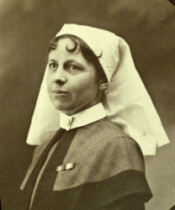 Grace Guthrie was awarded the MBE in 1947 for lifelong services to nursing. Bronchitic, her lungs were forever weakened, so I heard as a boy, by the traces of gas she inhaled from soldiers’ clothes and breath in a casualty clearing station. True or not, this detail always seemed powerfully symbolic to me. She died in 1968 at the age of 82. Thank you for the great pleasure and interest the diaries of Edith Appleton have given me: now, for the first time, I fully understand what my Great-aunt must also have experienced. If anyone has more information about Marcus Campbell’s great aunt, Grace Guthrie, or about the poem Sister, he would love to hear from you. His email address is marcus.a.campbell@gmail.com. Previous post: Read our Edie talk in French!